Providing a rustic and homely look that is filled with quality and character, there is simply no substitute for having a hardwood floor in your home. Much easier to clean than carpet, it offers both practicality and a good look. It’s crucial that you remove any loose nails, staples, screws or any other metallic fixtures from the floor. Failure to do this can be very dangerous and can result in sparks that create a fire hazard, in addition to this it can also tear the sanding sheets and damage the floor sander. Although our machines are dust free, it is still wise to utilise the masking tape well and mask up any gaps or holes. This is good practise if you are sanding any areas by hand or are using a sander that isn’t dust free. Working lengthways and starting against the wall at one end of the room, start the sander but do so by ensuring the drum is off of the floor. From here, slowly easy the drum to the floor and begin sanding. It’s important to sand with the grain. Move at a gradual pace and sand right down to the end of the room. Once you reach the end, lift the drum off of the floor, turn around and repeat the process on the next length of floor. After repeating this process, you will eventually find yourself against the wall on the opposite side of the room. Once you’re happy with the finish of the floor, it will now be time to use the edger to finish off the job. Unfortunately floor sanders will not sand right up to the skirting boards so you will need an edger to finish the job. Using the edger, complete the same sanding process as with the main sander in order to reach the edges, corners and any other hard to reach places in the room. In order to match up the sanding you have done with the floor sander and the edging sander, it may be that you need to ‘blend’ the sanding in. You can do this by using the edging sander in a semi-circular motion. To seal the floor and protect it from damage from knocks, stains or spills, you will want to varnish the floor. Before doing this however ensure that you have vacuumed the floor thoroughly to remove any wood dust or debris. 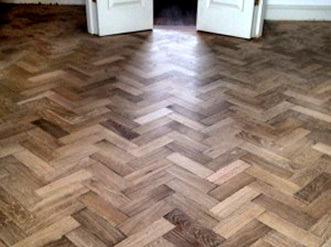 Unlike any other floorboards, parquet floors feature blocks with the grains going in opposite directions. While providing a great look, these blocks can be very difficult to sand. For best results when sanding a floor, you should sand with the grain. By doing this you are sanding with the fibres of the wood, not against them, which results in the best possible finish. Sanding against the grain however means you are tearing the wood’s fibres and stripping away the wood much faster. When sanding a parquet floor, this becomes a problem. On some of the blocks you will be sanding with the grain, whilst at the same time on the other blocks you will be sanding against the grain. To remedy this you can you use the straight and across method with an ordinary floor sander. This means ensuring that each of the blocks are being sanded with an equal degree of pressure and that the drum of the sander is never only sanding one block at a time. This can get difficult; however our Trio Finishing Sander presents a better solution for parquet floors. Designed to be versatile, the Trio Finishing Sander features three sanding disks, meaning the floor isn’t just being sanded in one direction and won’t leave any scratch marks. With the previous point in mind, be sure to test sand an area of your floor with a fine grit sanding sheet first. If this is enough to remove any dirt, paint or scratches that were previously on the floor then this grade sanding sheet will be sufficient and there will be no need to go coarser. Using a carpenter’s pencil to mark on the floor any areas where there are exposed nails, deep scratches or holes, by doing this you will be aware of areas where you will need to change the grit of the sanding sheets you are using.